CLEVELAND -- Trevor Bauer never backs down from any challenge or debate. He accepted this call. Bauer was pulled by manager Terry Francona after seven hitless innings and 117 pitches, and sat in the dugout watching as Toronto's Freddy Galvis broke up Cleveland's bid for a combined no-hitter with a leadoff single in the ninth inning of the Indians' 4-1 win Thursday night. Bauer was attempting to throw Cleveland's first no-hitter in 38 years -- on the 25th anniversary of Progressive Field's opening -- but was taken out when his pitch count climbed too high for Francona. "It was the right decision," he said. Once Bauer was out, Jon Edwards came in and got two outs before closer Brad Hand worked out of a bases-loaded jam. Hand, however, gave up a hard single to centre by Galvis. Moments later, Alen Hansen followed with Toronto's second hit and the Blue Jays scored before Hand struck out two for his third save. Bauer (1-0) was six outs away from completing his no-hitter, when Francona removed him as a precautionary measure. The right-hander may have been able to go farther -- he threw a career-high 127 pitches last season -- but on a chilly night and with so much season left, Francona played it cautiously. "I didn't want to take him out," Francona said. "He said he knew it was the right thing. I told him I hate it. He goes, 'I hate it, too, but I know it's the right thing.' I care too much about him and this organization to hurt somebody. I would have loved to have seen it because I don't doubt that he would have kept pitching and probably not given up a hit the way he was throwing. "I just have an obligation to do the right thing, even when it's not the funnest thing to do," he said. The enigmatic Bauer, best known for his quirky personality and unorthodox training methods, had only himself to blame for throwing too many pitches earlier in the game against Toronto's weak lineup. "I knew it was probably time to come out," he said. "That being said, I think my velocity was higher in that last inning probably than all innings. My stuff was sharp. If I'd gone back out, I feel like I would have gotten it, but it's a long season. We're in the second week of it." Bauer's performance was anything but pristine. He walked six -- including two in the third when he also hit a batter -- and even though he struck out eight, was never dominant against a Blue Jays team that has come close to being no-hit several times this season. 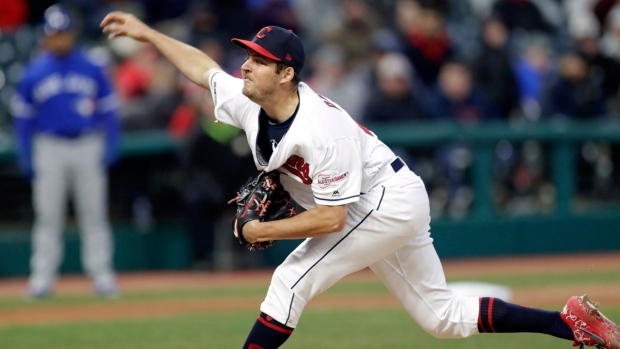 "Even though Bauer had a no-hitter, he wasn't as sharp as he usually is," Toronto manager Charlie Montoyo said. "But premier pitchers find a way to get it done, and he did." "I don't really care about a no-hitter or not," he said. "I care about putting up zeroes for the team and winning. I care about coming to the ballpark and seeing the fans and the seeing the people of Cleveland. I care about my teammates and trying to win a World Series. "If I throw a no-hitter that's great. If not that's great too as long as we win the game. " He's the first pitcher since 1934 to open the season allowing one hit or fewer in back-to-back outings of seven innings.